Kate Parrot is currently a PhD student in the Organization Studies Group at the MIT Sloan School of Management. She is interested in the relationship between adult human development, corporate social responsibility, and socially responsible investing. Kate holds a master's degree in Technology and Policy from MIT, where she studied multi-stakeholder approaches to global environmental issues. Kate also has a master's degree in Conscious Evolution from the Graduate Institute, and a B.S. in Biology from Oakland University. 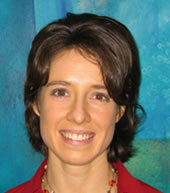 From 2003 to 2006, Kate served as a core research team member of the Generative Dialogue Project (www.generativedialogue.org), which aims to develop and promote dialogic approaches to global problem solving. Prior to her graduate work at MIT, Kate worked in municipal water resources planning in Colorado, and at the Rocky Mountain Institute in Snowmass, Colorado on corporate social responsibility and community economic development. Kate is the co-founder of Boston Omega and the Student Working Group for Sustainability@MIT , a graduate student group that aims to integrate the principles of social and environmental sustainability into MIT's operations, curricula, and research.